You may have already seen in the streets or in the U Bahn stations of Berlin intriguing advertisments that are not as they seem. 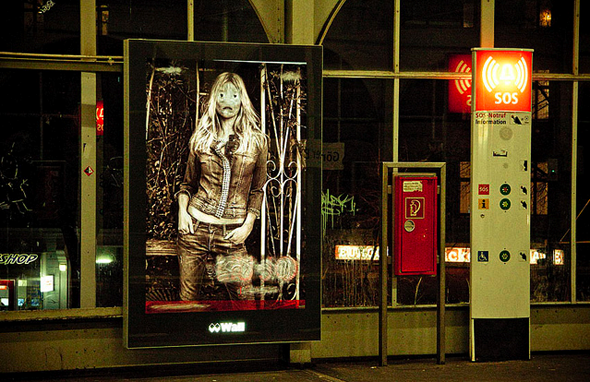 Berlin based artist Vermibus regularly collects advertising posters from the streets, using them in his studio as the base material for his work. There, a process of transformation begins. Using white spirits, he brushes away the faces and flesh of the models appearing in the posters as well as brand logos. Once the transformation is complete, he then reintroduces the adverts back into their original context, hijacking the publicity, and its purpose. 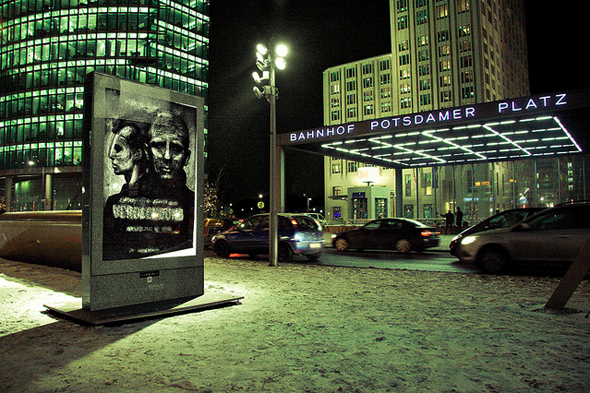 Last month the billboards of the entire Shönleinstraße and Gorlitzer U Bahn stations were covered with his work. The gesture of erasing the images with solvent is similar to the gesture of painting, but it is paintings counter action. The process is the same, but it is not adding colours on a canvas to create an image, it is removing the colours of an existing photographic image to create a new image and new characters. The models of the adverts have mutated. Some look like ghosts or mummies, some are reminiscent of Francis Bacon’s paintings, some of tribal make-up. By using the advertising space and how the human figures are represented in that space, Vermibus is removing the masks that we wear and is criticising advertisement which takes away a person’s identity to replace it by the one of the brand. 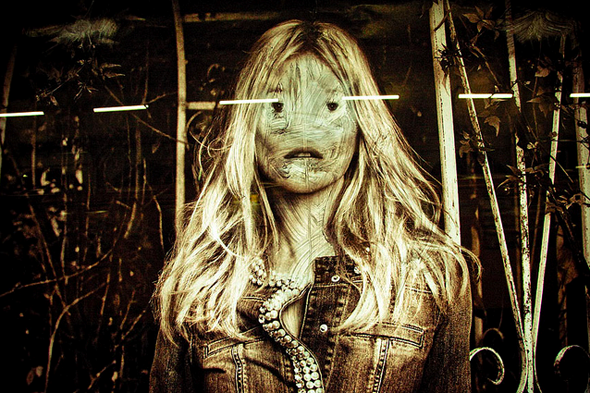 Vermibus’ art begins and ends in the street, which plays an essential role. People stop, stare, are intrigued, take photos. Publicity adverts show perfectly chiselled bodies and faces like in early ancient Egyptian art. By manipulating the image through removing the flesh of his subjects, Vermibus dehumanises those figures that were already depersonalised, but he is, in fact trying to find the aura of the individual, the personality that was lost. The posters and models that were so banal, are not so trivial anymore. People notice them, and stop to look at them. They are not part of the background anymore; they stand out in the public space. So, watch out! Blog entry by Florence Reidenbach, photos by Laura Colomé in Berlin; Thursday, Feb. 09, 2012.